Although breakfast is probably my favorite meal of the day, I’ve always been pretty terrible at making sure I actually have it. I’m never super hungry in the morning and especially when I used to have a long commute, I was always in a rush to get to work. Over the past few months I’ve made a serious effort to get some food in my belly every morning and it’s made a huge difference in improving my mood and productivity. Yay for nourishment! Breakfast does not have to be fancy. At all. I have straight up eggs and bacon fairly regularly mixed in with lots of smoothies, chia pudding… things that take no more than a few minutes to make. 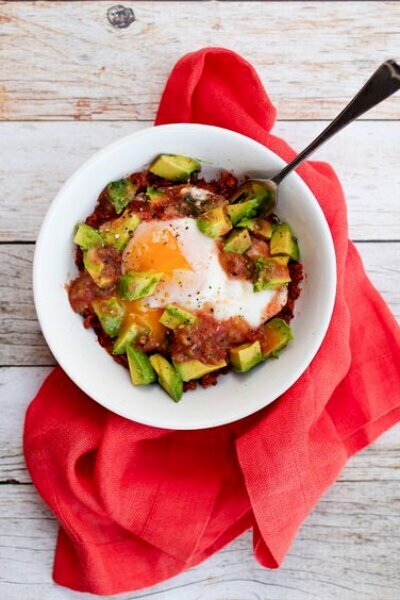 Occasionally, I try and make something slightly more exciting like this Chorizo Breakfast Bowl. Although… even this isn’t really fancy. My favorite thing about this dish is that you can pre-cook a pound or so of Chorizo and have it on hand throughout the week. All you have to do in the morning is heat it up and add your toppings! What really makes this dish pop for me is the Adobo Seasoning by Primal Palate. I received these spices in the mail the other day and they are so tremendously tasty. The Adobo is my favorite so far – I’ve been putting it on everything. Not only are all of their spices Organic and Non-GMO, but they’re also gluten free, kosher AND non-irradiated. High quality spices are really hard to come by these days and for the quality and spectacular taste, these are SUCH a bargain. I highly recommend you guys check them out and order some for yourself! You can make this breakfast bowl SO many different ways so feel free to get creative with your spices and toppings. You can even sub out the Chorizo if it’s not your fave and use a different type of ground meat! In a skillet, cook chorizo and beef with 2 teaspoons adobo spice until well done. Add spinach half way through. Chorizo produces quite a bit of fat so make sure to cook until the meat looks slightly crispy. Set aside. In the same pan, cook eggs sunny side up or over easy. If your pan doesn't have much remaining fat from the chorizo, feel free to add a little ghee, butter or alternative cooking fat to cook your egg in. You can also soft or hard boil your eggs if you won't be eating all 4 bowls right away. Pre-cooking soft or hard boiled eggs make them easy to pack to go! 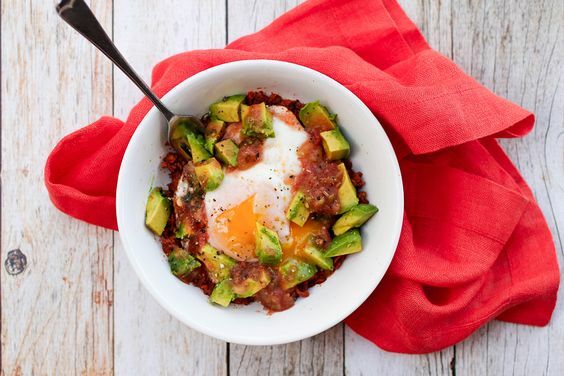 Place chorizo and beef into 4 bowls, evenly divided and lay eggs on top, following by salsa, avocado, remaining 2 teaspoons of adobo spice and salt and pepper, to taste. What brand of chorizo did you use? It seems like most have added soy flour which doesn’t work for Whole 30. Thanks! The one that I found was the case at Whole Foods. I asked to see the ingredients. It looked like they made it in house with just leftover meat and spices, so there wasn’t anything funky in it. That’s so funny! I went to whole foods before I read your reply and ended up getting their deli case chorizo. Looking forward to making this! I’m starting Whole 30 on Monday! Not sure if you have a Sprouts market nearby, but they make a whole 30 compliant chorizo that is delicious. It’s the Sprouts brand one from their meat counter. Very good to know! I do have a Sprouts near me! Hi Anya! I’m currently on my first Whole 30 journey and I can’t wait to try this recipe!